First of all, thank you all so much for your sweet messages about our pregnancy. It hasn't really been easy keeping this big secret but we wanted to make sure everything looked good, the baby was healthy and we were 'in the clear' to share our big news. So many of you have so many questions already and I'm trying to answer them as best I can so I thought I would just do a quick Q&A with this second pregnancy! This is actually such a hard question for me. Throughout the last few years of just having Lily, it's been such a joy watching her grow from an infant, to a crazy toddler who loves learning and exploring. While I'm excited to start over with a newborn again, I know my two and a half year old will start to need her attention again since she's only had Zach and mine for the last few years. I'm also really emotional. I've had several friends miscarry over the years with their second and while every day is a blessing in my eyes, I'm trying to stay positive and do my best to be healthy, active and unstressed as possible. I know everything is out of my hands and just grateful to experience this again. Did You Know Right Away You Were Pregnant? This is so funny because actually planning this pregnancy and knowing when I should take a pregnancy test, I was so anxious and thought certain symptoms came up a lot quicker with this pregnancy than with Lily's. One day about two weeks in, I was so tired at work that I went to my car and took a 45 minute nap! Right away that's always a signal that I may be pregnant. Of course a few days later, wine started tasting funny when I had a glass, certain foods just didn't seem appetizing and I was really tired all the time. Sure enough at 4 1/2 weeks I took a test and it came out positive! I'm not sure how much Lily really understands that she's going to be a big sister. We talk to her all the time that another baby is coming in a few months ( but she doesn't have much concept of time at the moment ). I did purchase a few baby books to read to her like "The New Baby" from the Critters Collection to help her become a bit prepared but she'll learn as the months go by I'm sure. Yes! I took a blood test at my 11 week appointment because I'm such a planner and really wanted to know what we were having! I can't wait to tell you all! I've Heard Woman Pop Quicker The Second Time. Is that true? For me, it for sure was true! Within 8 weeks I felt about 3 months pregnant and now being almost 13 weeks, I have a pretty large bump in my eyes. A few people have asked if I have twins in there because of how quickly my baby bump has become noticeable ( and no, just one in there ha! ) I'm actually loving on this bump so the bigger the better right now. Call me weird but I'm loving chicken sandwiches from Chic-Fil-A and creamy milkshakes. I also love chocolate covered potato chips, peanut butter crackers, ice-cream, cheese and fruit. I'm all over the place! How Did You Tell Zach? I had taken a test while he took Lily out with some friends. I had purchased a "I'm going to be promoted to BIG SISTER" shirt a few months prior not really thinking we'd get pregnant so soon after. When he and Lily got home, I made them each lunch ( and secretly sweating because I was so excited! ) and then went to change Lily's shirt saying she had a stain. Lily came running down the stairs afterwards and I told her to show Daddy her new shirt I had bought her. The look on Zach's face was priceless as he nearly doubled over reading it and shouted " NO WAY !" It was probably one of the best moment's together. Anyone else have advice on pregnancy the second time around? Awww I love this post! We will be having girl number two in February! Good luck! Well...I am on pregnancy number 7 ;) Lol. It's funny, some things are the same with each one and some things throw me for a loop. You definitely show earlier with each one, and are more in tune with your body. For me, the first trimester gets more difficult, as I have more children and get more nauseous with each one. But it will all be worth it. Congratulations! 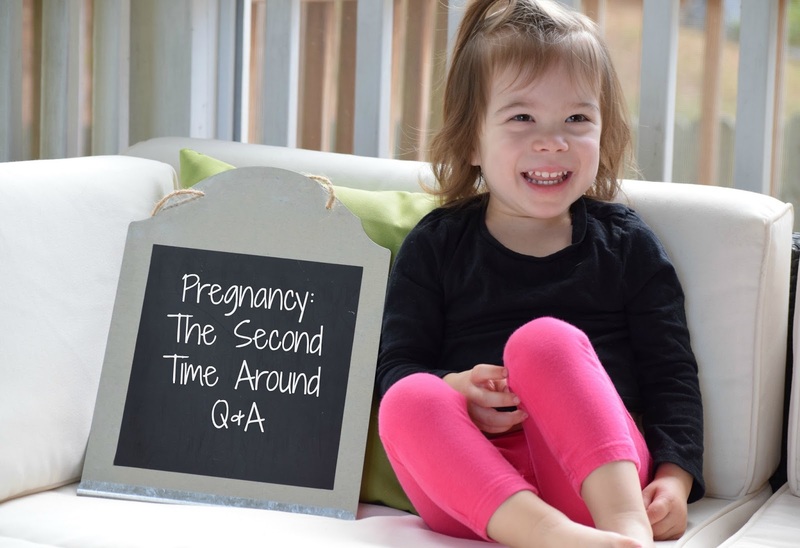 We have a 13 month old and want to wait about as long as you did but know it will be so exciting the second go round too! Love that you shared this update. I'm also pregnant with baby number two, and it's CRAZY keeping up with a toddler while being pregnant. Good luck, mama! Praying everything continues to stay healthy with that precious little babe. So sweet girl, I know it's scary with the unknown, but you guys are taking the right steps and it's in God's hands. I love how you surprised Zach with the news, so fun!! Ah! Congratulations!!! Loved how you shared the news with your hubby! Continued blessings!